Note that over the course of one year - 2016, market share for flower sales in the US dropped by 20% (85% to 65%) while concentrate sales jumped from 10% to 21%. "Beyond Buds" is a handbook to the future of marijuana. Prohibition's end has led to a technological revolution that s generated powerful medicines and products containing almost zero carcinogens and little smoke. Marijuana icon Ed Rosenthal and leading cannabis reporter David Downs guide readers through the best new consumer products, and demonstrate how to make and use the safest, cleanest extracts. 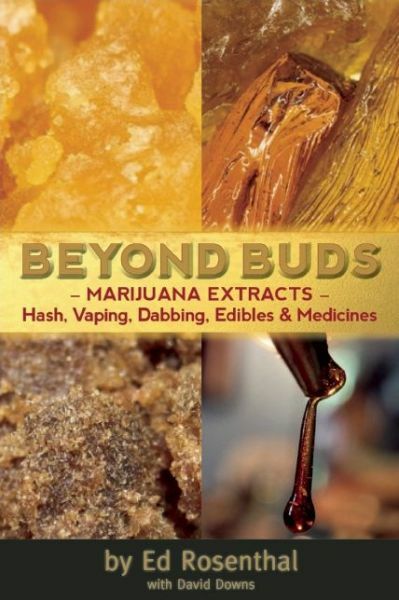 "Beyond Buds" details how award-winning artisans make hash and concentrates, and includes modern techniques utilizing dry ice and CO2. The book is a primer on making kief, water hash, tinctures, topicals, edibles, and other extracts from cannabis leaves, trim, and bud bits, and it goes on to explore and simplify the more exotic and trendy marijuana-infused products, such as butane hash oil (BHO), shatter, wax, and budder. More complex than lighting a joint, these innovative products call for new accessories special pipes, dabbing tools, and vaporizers all of which are reviewed and pictured in the book. "Beyond Buds" expands on Rosenthal s previous book "Ask Ed: Marijuana Gold: Trash to Stash." Completely updated with full-color photographs that are both how-to guides and eye candy, this book enables not only the health-conscious toker but also the bottom line driven cultivator.